I have been married for almost 30 years and have 5 wonderful children, all of whom are very close to each other (emotionally not in age). I taught Distributive Education (now called Marketing) in high school for 9 years. I am now the Product Structure Manager for Volvo Trucks North America in Dublin, Va. and have been there for 24 years. Many of you may remember we carrying a camera around in high school and I still take a lot of pictures. Currently I'm taking pictures and writing articles for the local newspaper about the middle and high school volleyball and basketball teams. My youngest daughter plays middle school volleyball and basketball. I also played rec league volleyball for 30 years and am am currently playing in a league with my three youngest children. I've coached rec league sports for the past 22 years and have coached AAU basketball,middle school volleyball and Junior Olympics volleyball. While in high school I missed my bus stop one day while reading a book on the bus and I still have a passion for reading. I like about anything, but really enjoy historical fiction, science fiction, fantasy, mystery/suspense, legal thrillers, etc. My favorite time of the year is the week at the beach were I can sit listening to the ocean with a book in my hands. I still keep in touch with Johnnie Walker and Dot Paynter regularily. That's about all for now! 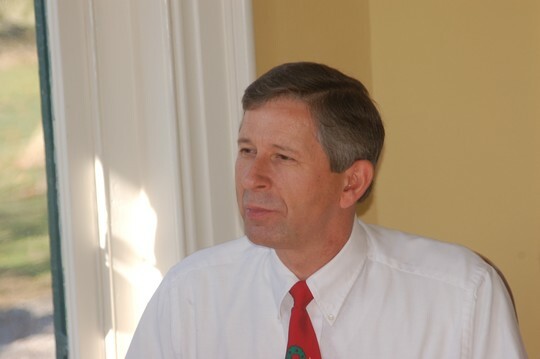 Dale White has a birthday today. The best part of life!!! 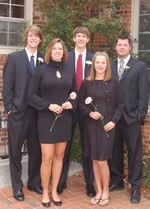 Stephen, Whitney, Carter, Gracie, Derek. 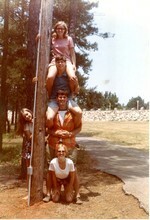 Senior Picnic: Top to Bottom: Birdina Miller, Jack Haskins, Doug Cumbia, Suzanne Poythress. Janice Wise behind pole. 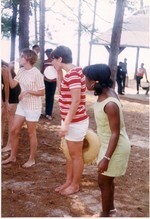 Senior Picnic: L-R: Valinda Dyer, Carol Reid. If anyone knows who the girl to the right is, please let me know. Senior Picnic: L-R: Elizabeth Ann Moody, Jane Jordan, Billy Poythress, Lynn Allen, Janice Wise, Cecelia Kirkland(in back), Birdina Miller, Sandra Allen and Suzanne Poythress. Senior Picnic: Cecelia Kirkland with Russ Morris giving the peace sign. Senior Picnic: Top L-R: Janice Wise, Birdina Miller, Suzanne Poythress, Sandra Allen. Middle L-R: Dale White, Jack Haskins, Dave Crawford, Doug Cumbia. Bottom: Cecelia Kirkland, Elizabeth Ann Moody, Jane Jordan. Senior Picnic: L-R: Dale White, Janice Wise, Suzanne Poythress, Jack Haskins, Doug Cumbia, Birdina Miller. Janice Wise taking up lunch money. Senior Picnic: L-R: Jane Jordan, Billy Poythress, Lynn Allen, Russ Morris, Jack Haskins, Suzanne Poythress, Dale White, Janice Wise, Sandra Allen, Elizabeth Ann Moody, Cecelia Kirkland. Senior Picnic: Standing left: Jane Jordan. Top L-R: Suzanne Poythress and Birdina Miller. Middle L-R: Janice Wise, Lynn Allen, Elizabeth Ann Moody. Bottom L-R: Billy Poythress, Doug Cumbia, Dale White, Jack Haskins. Standing Right: Cecelia Kirkland and Sandra Allen.